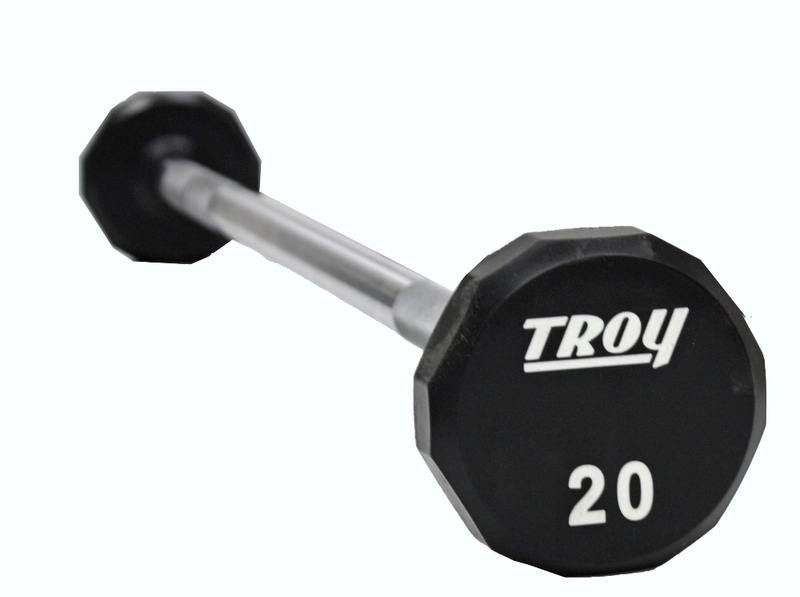 Troy Solid Urethane 12 Sided Straight Barbell 20-110lbs TSB-020-110-U commercial pro style fixed barbells are quality engineered and built to last. These pro style fixed barbells are pre-assembled to ensure that all TROY products meet the standards required in heavy used commercial applications. These urethane encased barbells are Troy's top of the line and offer the highest quality available today! Large easy to read numbers on each end of the barbell allow for easy weight selection. Set includes (1)ea. 20lb - 110lb barbell in 10lb increments. Our patented 12-sided Urethane-Straight Barbell features a solid steel head encased in high grade urethane, that is securely attached to a hard chrome, steel bar. The 12-sided design reduces rolling, and the 34-millimeter straight handle is made of steel in a chrome finish. Order your Troy Solid Urethane 12 Sided Straight Barbell 20-110lbs TSB-020-110-U from FitnessZone.com today!